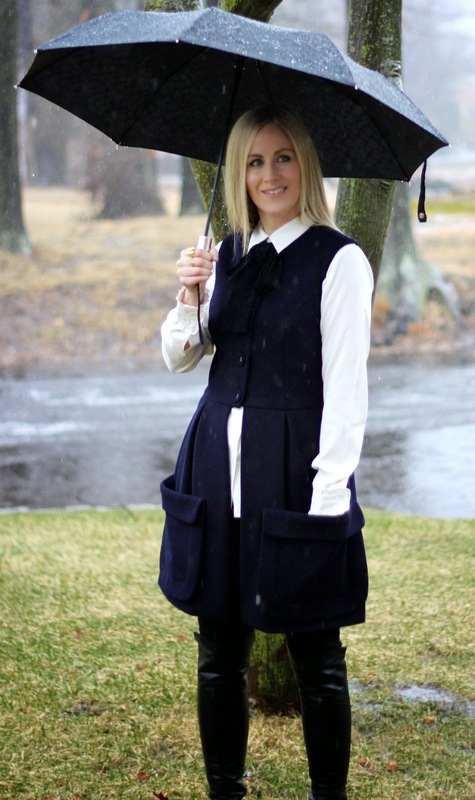 Fashion never stops, even in the rain, and who would have thought an umbrella would accessorize an outfit so well! Recently, I have been utilizing the items in my closet instead of buying new. This vest is one of my favorites that I picked up for next to nothing at a local consignment shop a couple of years ago, and I still love it! It's unique, but at the same time very classic. It's days like today when I find myself feeling a tiny bit envious of my fellow fashion bloggers who live in warmer climates. Freezing rain is not necessarily the best element to take photographs in, so, "when in Rome"(or NJ), right? I actually didn't mind it. Besides, the cold air was a welcome change from being couped up in the house all day. It was also a great chance to show off my new Vince Camuto coat that I have not taken off since I received it in the mail last week. I'm obsessed! Someone at work told me, if I was a coat, It would be this one! LOL! Apparently it fits my personality. Stay warm all of you North Easterners. Do you have a favorite coat, jacket, or maybe even a fabulous umbrella that shield you from the elements? Leggings ~ H&M ~ similar// Boots ~ Stewart Weitzman(On major sale)// Umbrella ~ Coach .